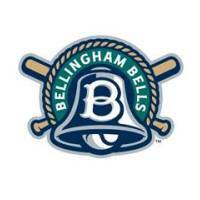 Seventeen Bellingham Bells have been honored with West Coast League post-season accolades, WCL Commissioner Rob Neyer announced today. 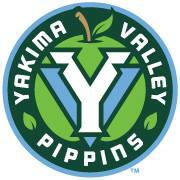 Shortstop Ernie Yake (Gonzaga), along with pitchers Nick Nastrini (UCLA) and Theron Kay (Cal-State Northridge) were named to the All-WCL first team, while third baseman Zach Needham (Lewis & Clark State) and pitchers Taylor Davis (Gonzaga) and Justin Armbruester (Pacific Lutheran) were named to the All-WCL second team. Shortstop Matt McLain (UCLA) was named the WCL’s Top Prospect. 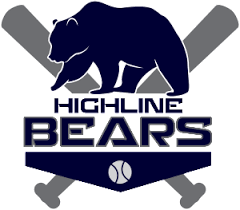 McLain joined the Bells in July after being drafted in the first round by the Arizona Diamondbacks (25th overall) and deciding to forego professional baseball to attend UCLA. 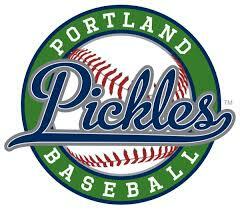 First year owner Glenn Kirkpatrick was also honored by the WCL as the league’s executive of the year. 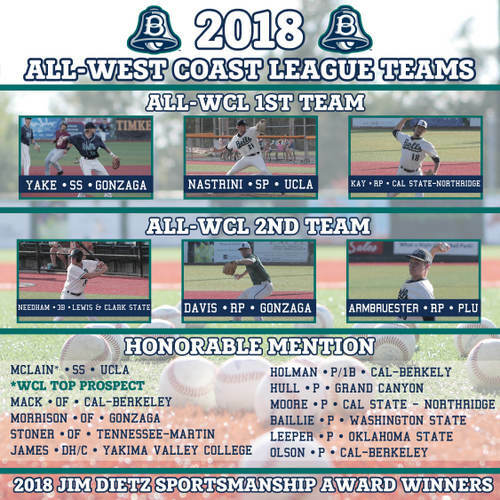 For the second season in a row, the Bells also took home the Jim Dietz Sportsmanship Award, an award voted on by West Coast League coaches to recognize the team which best exemplifies the ideals of sportsmanship on the diamond.